In past years the department had become something of a catch-all for various government functions. This is no longer the case, as many activities have been transferred to other departments. The MDMB activities are now limited to its core mission of providing management services to other state departments. Significantly, providing information services to state departments is no longer part of that mission, having been transferred to the new Department of Information Technology. However, the department does continue to be the custodian for certain provisions of labor agreements between the state and its employees (see union “Professional Development Funds, below). This appropriation funds state employee union “Professional Development Funds.” These programs provide retraining, training, seminars, workshops and conferences for members of unions representing state employees. This appropriation should be eliminated. Organized labor plays an indispensable role in advancing the interests of workers. However, labor unions and their programs, like corporations, should not be subsidized by taxpayers for job training or any other reason. They should be required to earn their support from the voluntary contributions of their members. Savings: 2,005,000. This appropriation funds interdepartmental mail and freight delivery services to state agencies and offices throughout the state. This service should be outsourced. Based on experience with privatization programs involving similar government operations, it is likely that significant savings and quality improvements can be realized by subjecting this function to market competition. Currently 29 full-time-equivalent staff positions are apportioned to this function. Savings of 10 percent to 30 percent are not uncommon in government outsourcing initiatives. For purposes of calculating savings, the Mackinac Center for Public Policy will use a conservative 10 percent. Savings: $200,300. Act No. 528, Public Acts of 2002, p. 7. 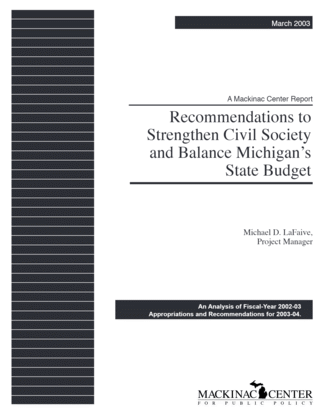 Michigan Department of Management and Budget, “Overview.” Accessible on the Internet at http://www.michigan.gov/dmb/0,1607,7-150-9131_9353_13023---,00.html. Includes Professional Development Fund-MPES; Professional Development Fund-UAW; Professional Development Fund, Local 31-M; Professional Development Fund-MSC; Professional Development Fund – AFSCME; Professional Development Fund-Nonexclusively Represented Employees. Per Michigan Administrative Information Network database search by Jessica Runnels, Senate Fiscal Agency.